OPEN 30 DAYS A YEAR, THAT’S IT!!! FinishLine RV Park is centrally located directly across from the Daytona International Speedway Start/Finishline. Just behind Hooters and the 7-11. Exactly 456 steps away!! Don’t be fooled by any other RV Park!!!! 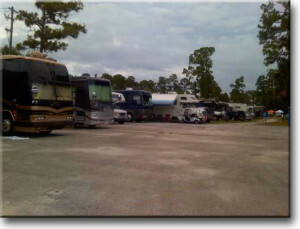 WE ARE THE CLOSEST RV PARK TO ANY ENTRANCE AT THE TRACK, PERIOD!! During your stay at our park, enjoy all Daytona has to offer. Minutes from the World’s Most Famous Beach, and close to everything. FinishLine RV Park is seasonal, and only open 30 days a year. We are open only during Daytona’s hottest events, such as Speed Week, The Daytona 500, Bike Week, The Coke Zero 400, and BiketoberFest. Make sure to reserve your space early! We look forward to meeting you and making your visit to Daytona always one to remember! Welcome to Finishline Park. The closest campground to the start/finishline of the NEWLY REMODELED Daytona International Speedway located in Daytona Beach, Florida. With the race track located just a few miles from “The World’s Most Famous Beach”. Finishline Park is the perfect location for your stay when you’re here for some fun and excitement. Also, because we are just steps from the speedway property, we are a logical place to park your recreational vehicle and stay on our 25+ acre campground during your stay. Because we are “A Special Events Campground”, Finishline Park is only open 30 days a year for the top 4 events of the year. These events include The Daytona 500 (The Great American Race), Bikeweek 2012, The Coke Zero Sugar 400 and Biketoberfest. Because of our location, R.V. campers have been making Finishline Park their destination for these great events for over 10 years. Located behind Hooters off of International Speedway Blvd. our campground is centered in the middle of Daytona Beach. Plus we are located within walking distance to Souvenir City at the track, ONE DAYTONA shops and restaurants which include BASS PRO SHOPS, Cobb’s Luxury Theatres, P.F. Chang’s Okalahoma Joe’s BBQ, Rock Bottom Brewery and Ben Jerry’s! Plus 7-11, Carrabba’s, Home Depot, Buffalo Wild Wings, Verizon, Taco Bell, Panera’s, Cracker Barrel, B.J.s, Chili’s and within 3 miles of Wal-Mart and Publix. Also, because we are just 1 mile off of I95 it’s easy to find us and to get on your way when your vacation is complete. And because of our location, you can enjoy the race track known as” The World Center of Racing” up close. In fact, Finishline Park is so close you can smell it, hear it and see it from most sites in our park. There’s not a better feeling knowing you can walk from the comforts of your camp site to your seats inside the track with no worries about parking or driving when you’re having the time of your life. And thanks to early pioneers like Random Olds and Sir Malcolm Campbell decision to make some daring runs on the sands of Ormond and Daytona Beach, Finishline Park is here today. Those early dare devils help put this area on the map and gave Ormond Beach the distinct name of “The Birth Place of Speed”. It also help bring big time racing to the beach at Ponce Inlet and finally to its current location. Thank you gentlemen and thank you Big Bill France for bringing the track close to us. Also a special thanks to my Dad, Big Ralph for having the vision to buy this property in the early 60’s. It’s because of him, we are here today!! We are also close to all major Hotels, Motels, Disney World, Sea World and all the Orlando attractions because ISB intersects with I-4 just west of our location. And of course we are close to all Daytona has to offer like the Ocean Deck, The Oyster pub, The River Grille, Inlet Harbor, Down The Hatch and the Light House. Along with Mario’s, Bonefish Grille, Charlie Horse, Houligan’s and Stonewoods. Also during our Bikeweek and Biketoberfest events Finishline Park is in the center of all the special venues like the Cabbage Patch for coleslaw wrestling, Main St. bars like Dirty Harry’s and The Boot Hill plus just down the road from Bruce Rossmeyer’s Destination Daytona, Beaver Bar and The Iron Horse Saloon. We are also between ISB and LPGA which has many back roads to the Main St. Area and US1 special events for avoiding traffic jams during all our special events. Each venue is just minutes away from us. Other close locations are Ormond Beach’s famous Loop ride and Snack Jack’s in Flagler Beach. Our accommodations include clean hot showers, a ice machine, daily cleaned port a lets, car parking, camping under trees, camping on hard top, 30 & 50 amp power sites, fresh water, daily garbage pickup and friendly staff that will make your visit a stay to remember. Had a great few days at Finishline over the weekend…You all do a great job and have great people that stay there! I’m thinking of coming back in July either with Bob M. or with another group from Chicago and wondered if you had any recommendations for who to rent RVs from? You guys did it again!! We had a great time and felt really at home. Your location is perfect for walking to the track and good restaurants. Safe, sound and convenient!! You’re the best! !